Pregnancy is an amazing time in any woman’s life, but it can also be very challenging for a number of reasons. Your body is going through many changes as your baby grows, so taking it easy is crucial to your health. Due to the changes and your heightened levels of exhaustion, it can be easy to ignore your partner, or not be able to spend as much time with them as you used to. During pregnancy, it is especially important to continue the strong bond between you and your partner so you both can care for your new child in a loving environment. 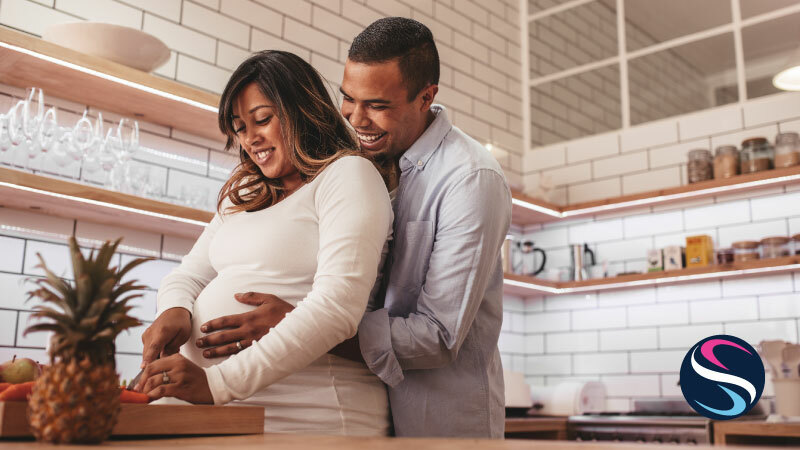 Even though you’re carrying the baby and doing the hard work, keeping your partner involved in many aspects of your pregnancy can strengthen the bond between you. Here are our favorite ways you can bond with your partner throughout all the stages of your pregnancy. Being stuck in a routine can make any relationship dull, even while you’re pregnant. To change things up, try getting away to spending some quality time together. Even if it’s a weekend trip a couple of hours away, doing something different can be a fun and exciting way to strengthen your connection before the baby comes. Getting away can also be a good chance to talk about the pregnancy and the exciting (and sometimes scary) changes that accompany it. Discussing the future and what you’re looking forward to or nervous about, or choosing some potential baby names can have a fresh outlook in a different environment. Taking a little trip can leave you feeling refreshed, happy, and ready to take on the next challenge ahead of you. Keeping your partner involved in the numerous medical appointments you will go to, especially at milestone appointments, will make more of an impact than you may imagine and is one of the best ways for you to strengthen the bond between you two. Having your partner hear the baby’s heartbeat first hand, take a look at the ultrasound rather than just looking at the photo print-out, listen to what your doctor tells you, ask questions, and be there to hold your hand and support you will help them feel more involved in the process. The more involved they feel, the stronger the bond will be between you. Besides doctor’s appointments, it’s important to let your partner know about the changes happening to your body. Giving them updates on your thoughts, emotions and what you are feeling mentally and physically can help you relax and give your partner insight into your pregnancy. While these changes may be intimidating to them, it’s important to let them know about your physical changes, pain or discomfort, and how they may be able to help you feel better. This also goes for any bizarre cravings you may be experiencing – for us it was milkshakes! Shining Light Prenatal Education Center and Midwife Center. Having your partner stay involved, be there when you need them, and tell them about your thoughts and feelings will keep your bond strong or make it even stronger. One of the things that you may want to bring up to your partner is the pain you could be feeling from your growing baby bump. Back aches and pains can put a damper on your mood and leave you feeling uncomfortable and exhausted, and finding relief can sometimes be easier said than done. Fortunately, there is a solution that can work wonders on your back and get you feeling up for spending some quality time with your partner. The SPAND-ICE® Maternity Relief Wrap is a safe, comfortable method for relieving back pain associated with pregnancy. Hot and cold wraps can support your back and improve posture while the unique design helps with belly support and leaves you feeling pain-free! Click here for more information on this life-changing product!